Most business leaders agree that a strong brand adds value to their organization. Any type of organization—consumer focused or business-to-business company, not-for-profts or charities, even causes and social change initiatives—will benefit from having a brand that is differentiated and desirable. Yet while no one disagrees with the value of having a good brand, many organizations still struggle to understand how to set the foundation of a brand strategy in place, and then translate the strategy into behaviours that drive the success of the organization. Failing to define an authentic, consistent and compelling story, organizations derail the process with short-sighted tactics and misguided trends. This is one of the most popular presentations, engaging audiences for over a decade with solid concepts and clear examples that work for organizations of any size—from a start-up of one to an international corporation of thousands. 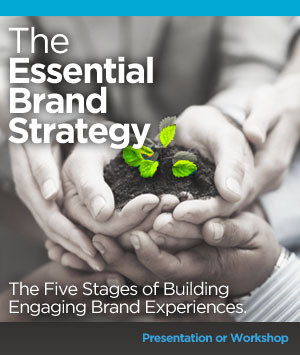 The Five Stages of Engaging Brands is presented to students and business leaders, offering relevant insights into why a brand works, how all stakeholders experience a brand, and how to build a foundation for early brand success while encouraging growth.